Water is the substance that we refer to as the universal solvent. A solvent is simply a liquid that other substances can dissolve in, and the reason that water has gained the label of universal solvent is because no other solvent can dissolve as many substances as it can. That’s mostly what makes it so critical to life on earth. Also, amazingly, every body of water found on earth, including ice, sustains one form of life or another that has adapted to the temperature and pressure found in that form of water. The simple fact that it’s always exciting for scientists to find water, which is associated with life, on other planets says a lot about this seemingly-simple substance. Water is the most abundant substance in organisms and in cells. Of course, there are many obvious uses for water, like drinking, washing, and putting out fires, and that’s thanks to the characteristics it possesses that make it the universal solvent. Water is very important for life because many important reactions in the bodies of organisms need an aqueous environment in order to occur. For example, water is essential for digesting proteins into amino acids, and in photosynthesis and digestion. This is a big part of why water is the universal solvent. Polarity is the unevenness of distribution of electrons in a molecule, which leads to a single molecule having two opposed sides; one negative and one positive. 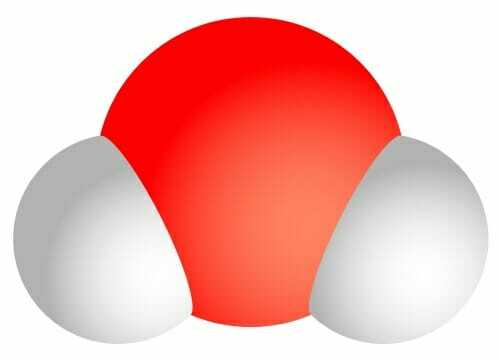 Now, water has the molecular formula H2O, so every water molecule has two hydrogen atoms and one oxygen atom as you can see in the diagram below. The hydrogen atoms aren’t on opposite sides of each other, and they carry a partial positive charge. This means that they create the positively charged part of the molecule, while the oxygen end creates the negatively charged part. This polarity means that water can attach to, and therefore dissolve, polar and ionic (charged) substances. Water’s polarity allows it to create a “sphere of hydration” around molecules, keeping them apart and unable to bond with one another after they have separated. Let’s assume that we added sodium chloride (NaCl), or table salt, to a glass of water. 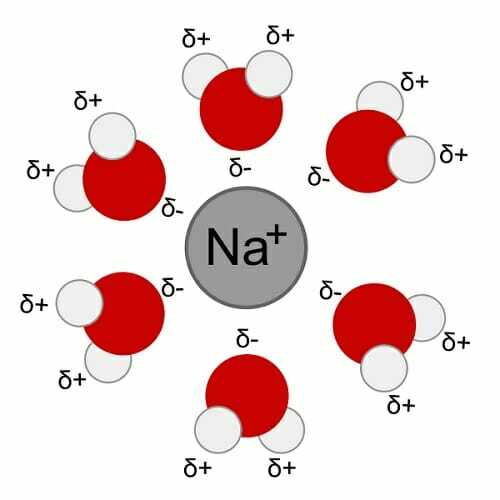 The sodium and chlorine atoms will separate as the charges on the water pull them apart, leading to a positive sodium ion and a negative chlorine ion. The water molecules will surround each ion from all sides that it can’t go back to its original bond. As shown below, the partially negative oxygen sides of the molecules create a shell that surrounds the sodium ion carrying a positive charge. This is what allows many substances to dissolve in water, which is critical for the removal of some toxins and the movement of substances in and out of our cells. Surface tension is a property that makes water and some other liquids seem to have an elastic surface due to high cohesiveness between their molecules. It is a result of water’s polarity and the molecules’ attraction to one another that’s due to the strong hydrogen bonds, and it is what allows some insects and spiders to stand on water. This property of water also allows it to move up the stems of plants against gravity and in our own small blood vessels, due to its ability to adhere to the walls of the vessels. It is also the reason that waves and water droplets can form. The amount of energy needed to raise the temperature of one gram of water by 1 degree Celsius is its specific heat, and at one calorie per gram, it is much higher than the specific heat of most liquids. This is great news for us, since we’re about 60% water, and we it wouldn’t be possible for us to survive if our bodies were to cool down and heat up significantly and rapidly. This is also critical for all other organisms’ survival, including that of aquatic organisms. It means that the oceans and rivers aren’t constantly freezing over or evaporating with changes of temperature. If water couldn’t stabilize its temperature, energy that is released during metabolism in living organisms would result in overheating and death. When we place a cube of ice in water, it floats, and thankfully the same applies in the case of icebergs. If ice were denser than water, it would constantly freeze on top then sink until all bodies of water turn into ice, destroying all life. Water also exists as gas, liquid, and solid at a very small temperature range, which means that we can find it in all three forms on earth depending on where we are, and often in the same place. That’s not a commonly found property. Solute – It is a substance that dissolves in another, the solvent. Covalent bond – The sharing of electrons between atoms to form a molecule. Water cycle – The process of water circulating between different elements of the earth – the atmosphere, land, and oceans. Metabolism – All the chemical reactions occurring inside living organisms. A. It has one negative side and another that is positive. B. It’s the universal solvent. C. It has two hydrogen atoms. D. It is densest in solid form. A is correct. Water has a side that is slightly positive and one that is slightly negative. 2. Which of the following is the force that holds water molecules together? D is correct. Hydrogen bonds form between the oxygen atoms and the hydrogen atoms of different water molecules. 3. Which property refers to water molecules sticking together? C is correct. The cohesive forces caused by hydrogen bonds are what make water seem elastic.